Satterfield Realty and Development, Inc. has a history in Pocatello, Idaho dating back to 1914 when my great-grandfather, Ammon Y (AY) Satterfield, at the age of 31, moved to the city of Pocatello from Sterling, Idaho, a little farming community between Aberdeen and Blackfoot. He was working as the President and General Manager of the Intermountain Farmers Equity where he would travel across the United States securing contracts for equipment and sale of crops for local farmers to eastern markets. When the Great Depression hit in 1929, it was not easy for anyone in the industry. AY was elected to the Idaho Legislature from 1932-1936 while at the same time he founded the Beneficial Protective Association, an insurance company for individuals and farmers. The effects of the Great Depression were very visible in Pocatello, and many real estate properties were being foreclosed on as well as sold on tax sale due to default. AY speculated that the depression would not last forever so starting in 1937, he began to purchase tracts of land in the Alameda area of Pocatello using money he had saved as a frugal businessman. On November 15th, 1937, AY took deed to a number of properties in the Pocatello Townsite, Fairview Townsite, Buena Vista Townsite, Victory Park Townsite, Inglenook Acres Townsite, and the North Pocatello Townsite after the owners became insolvent and the courts ordered the properties sold. Later in January of 1939, AY purchased additional adjacent properties in the Inglenook Acres and Inglenook Terraces subdivisions . Although platted years previously, the properties were mostly unimproved and being used as farm fields. With the war looming and the depression still in place, AY did not make any improvements immediately because of economic conditions. He farmed some of the property and sold some of the lots that were serviced. In 1946, after World War II had ended, the economic climate had changed. Seeing the conditions as more favorable, AY replatted and developed out the Buena Vista Townsite, consisting of Walnut, Yellowstone (then called Monroe Ave), Pine St. and Pershing Ave. and started selling those properties. This would become the first of many plats recorded by AY. Two years later in 1948, AY along with a business partner, developed their next subdivision, Inglenook Addition. The following year, 1949, AY along with his son Charles (my grandfather) platted Inglenook Terrace Subdivision. In that same year, my grandfather, Charles, built the Hiawatha Motel on the corner of Pine and Yellowstone. He ran the motel while selling the lots they owned and had developed. Charles was then called on an LDS mission to Australia from 1952-1954. This was at great sacrifice for him and his family. At the age of 14, his oldest son Kenneth would be left to care for his mother and younger sister. He helped manage the motel as well as farmed some of the surrounding family owned, undeveloped property. Having the Hiawatha Motel allowed them to manage through those years. AY continued to develop subdivisions throughout the 50’s, including Inglenook Heights subdivisions where he named the streets after himself and his family, a tradition that would carry on with future developments. He donated the land for a park next to Ammon St. and it was named Ammon Park after Ammon Y Satterfield. He named three other streets there after his sons and partners in business, Charles, Homer, and Jackson (Jack). In 1956, two years after Charles returned from Austrailia, AY formed partnerships with his three sons, Charles, Homer, and Jack. Satterfield Realty & Insurance, Satterfield and Company, and Inglenook Shopping Center were formally organized and recognized as the names of the affiliated companies. 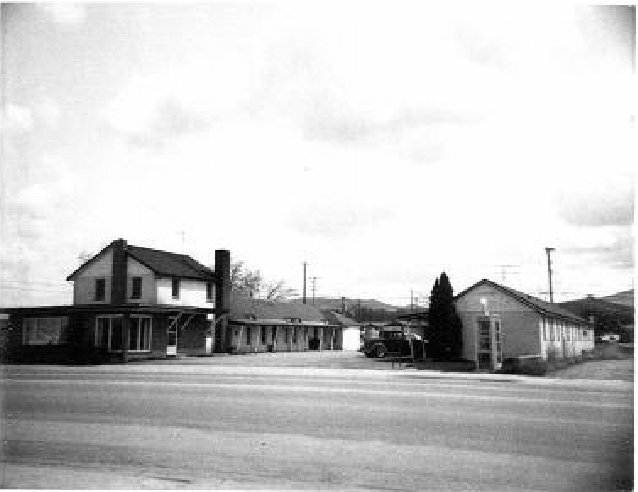 Previously held personal real estate was deeded into the partnerships, including the Hiawatha Motel, which was later sold and the funds were reinvested in subdivision developments. AY became more of a capital partner and less of a managing partner at that time, and the three brothers, Charles, Homer, and Jack were managing the companies. In 1962 it was decided that the companies should combine and incorporate, so they did under the name Satterfield Realty and Insurance, Inc. My grandfather, Charles, would oversee the real estate development and subdivisions while Homer and Jack would manage the real estate brokerage and insurance ends of the company. In 1958 the opportunity arose to purchase a number of acres on the east bench, now known as the Highland area. A corporation called Pocatello Creek Development Company was formed with AY Satterfield, his three sons Charles, Homer, and Jack along with three other minority shareholders, Stephenson, Barrett, and Coleman, who were gradually bought out through the years. In 1960, Pocatello Creek Development Company donated 116 acres of the land to the City of Alameda (later annexed into the City of Pocatello) to develop an 18 hole golf course. They also sold property to the school district for a new high school which is now known as Highland High School. There were many who were upset that the school district decided to build where they did. The area was still undeveloped, but it only took a few years before a number of subdivisions and improvements, including the golf course, made the area one of the nicest in the City. Much of the developing at that time was done under the Pocatello Creek Development Company name and Satterfield Realty would manage the sale of the properties after development. From 1966-1969, Homer was called as a Mission President, leaving Charles and Jack to care for the company during those years. In 1973 another corporation was formed by the second generation Satterfield brothers. Juniper Land Corporation was formed to purchase additional property on the southern part of the Highland bench. Juniper Land Corporation served solely as a land holding company for Satterfield Realty from 1973 till 2012 when we sold our interests in Juniper Land in order to focus on the property under Pocatello Creek Development. Charles Satterfield wanted to retire in 1978 and so he offered his position in the companies to his son Kenneth Satterfield, my father. Ken had been working for the Bureau of Land Management since 1960 after graduating from Utah State, but decided that taking his fathers place in the family company would be a good opportunity for him and his family. He came into the company with a background in government land management and immediately began to manage the developments the company was involved in. The recession of the early 80’s soon hit and interest rates soared to 18% making real estate a difficult venture to be in, but with persistence they made it through. In 1984 it was decided that Satterfield Realty become the developers, and that Pocatello Creek Development Company would simply serve as a land holding company. Nearly 30 years later, the companies are still structured this way. It was that same year that we built the first section of Satterfield Drive in the Crestview Park 1st Addition subdivision. Satterfield Drive would later tie into Pocatello Creek Road and serve as a primary access to the Highland Area. In 1991, Satterfield Realty and Insurance, Inc. sold off the insurance branch of the company and changed the company name to Satterfield Realty and Development, Inc. to reflect the exit from the insurance business. Homer had basically retired by that time, with Jack soon to follow, although they would try and stay connected with the happenings of the company. During this time, Steve Satterfield, who is Ken’s cousin, was the designated real estate broker and partners with Ken for a number of years. Steve would manage the various real estate agents employed through the brokerage while Ken oversaw the subdivision development and land sales. Steve later retired from the business in 2009 and sold his ownership interests in 2011. I entered the company in 2001, while still attending college, as an assistant development manager under my father, Ken. The first full development project I saw was Partridge Ridge 2nd Addition which consisted of Michelle St. and Kelsea Place off of the lower part of Satterfield Drive. I graduated from Idaho State University in December of 2003, and in January of 2004, my father retired from active work in the company, although he retained a position on the board of directors. Out of necessity, I became more involved in the real estate brokerage side of the company. I took the required classes for my real estate license in 2004, and would act as both the development manager for the company as well as a real estate agent. The Great Recession that started in 2008 created some difficult times for anyone in the real estate industry. Even though interest rates did not rise like in the early 80’s, the continually declining market made these to be the worst economic times faced since the Great Depression. The recession caused some changes to occur within the companies. In 2009 I became president of Pocatello Creek Development Company and in 2011, became the president and designated real estate broker for Satterfield Realty & Development, Inc., managing both the development and brokerage ends of the company. Until recently, the brokerage was very dependent on support from the development portion of the company. As President, I was charged with restructuring the company to balance out an outdated business system, bringing it more inline with modern business practices. These recent changes have been made to position the company for future growth as we are now coming out of the recent real estate recession. As the fourth generation owner of the family business, I am proud of the heritage left by my forefathers. From its beginnings in 1937 till now, Satterfield Realty has been through many changes. These changes have allowed us to stay consistent in carrying on the name of a reputable family owned business involved in developments throughout northern Pocatello. With 350 acres of land owned by Pocatello Creek Development Company remaining to develop and infinite future opportunities to expand and venture, we at Satterfield Realty & Development, Inc. are eager to experience the next chapters of our business.